Carl Jackson (left) first became a caddy aged 11 and has been a staple on the Augusta course for the past 50 years. One Augusta legend will be striding the fairways this week for his 50th crack at the Masters. He not only knows this verdant pasture like the back of his hand, he knows his hometown of Augusta even better. To say he has seen it all before, literally from both sides of the fence, is probably an understatement. Carl Jackson may not be a household name in world sport, but here - on the grounds of Augusta National - he is an integral part of the tradition of both the golf club and the tournament. A unique link to an era of segregation is matched by a splendid connection to the Masters tournament that began when he was just 14. When Jackson first got wind of an opportunity to earn a crust by caddying at Augusta, he was 11 years old. It was the late 1950s and, like so many exclusive golf clubs in the south, there was an all-white membership at the end of Magnolia Lane and an all-black caddy shack. Times were tough at home, and a chance to earn some cash was crucial to the family finances. Two years later, he got a priceless chance to caddy in the Masters and, with just one exception to an otherwise unbroken record of service, he now finds himself caddying at the tournament for the 50th time. Jackson seems emblematic of an era in which the famous invitational - one of golf's four majors - has evolved with society: Lee Elder became the first black player to qualify and compete in 1975, the first black member was admitted in 1991 and Tiger Woods became the first black golfer to win in 1997. It has also redefined the game - the Masters introduced "over and under" scoring, was the first event to rope off crowd galleries and to provide an on-course scoreboard network. It is unlikely to ever happen again. For certain there will be no 14-year-old caddies working at this level of professional golf in the modern day, and it will be exceptional to see anyone caddying at this or any other event at the ripe old age of 64. 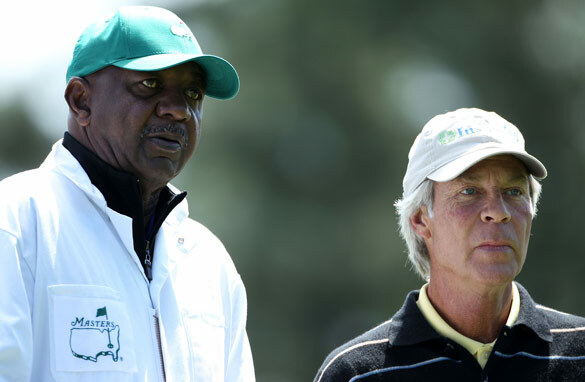 Carl Jackson is a man known to many ardent followers of the Masters as the loyal bagman to former champion Ben Crenshaw. Their partnership dates back to the Texan’s Augusta debut in 1976 when the duo contrived to finish the week as impressive runner-up, although some ways behind the record-breaking winner that year, Raymond Floyd. They went on to contend in many subsequent Masters, winning on two occasions. Crenshaw was the man with the golden putting touch and the local with unparalleled knowledge of the course by his side. Watching them last Sunday as they enjoyed a quiet warm-up ahead of tournament week, it was clear that their relationship was way more than that of player and caddy. This was a true friendship, built up over many years through mutual respect and trust. Only once in the last 35 years have they been apart at the Masters, when Jackson underwent treatment for cancer back in 2001.
great post. it's a example that when someone shines, he always has others who support him from behind, whose works are unnoticed but essential and pivotal for his success. nice to cast a spotlight on those people even if they may be too humble to take it. What's more is Mr. Jackson has conquered his cancer to come back to Masters! My gut feeling is , just like a tiger has the killer instinct, human Tyger, who actually made contemporary golf so exciting as it is, will come back to make a kill. He ain't yet a wounded tiger! He's just a little bruised; give him a psychological boost. Don't dump him yet for a little bit of juvenile indiscretion.Everyone fails once in a while. No one is perfect. Everyone deserves a second chance! No one has an absolute monopoly over virtues. We are human and thus fallable and very easily. Tyger deserves a gentle and kind rehab in our golf community; we have been entertained by this great golfer for more than a decade! Give him a break !